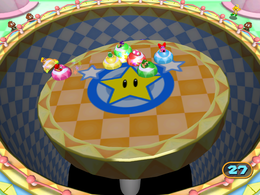 Bumper to Bumper is an 8-player minigame in Mario Party 7. This minigame is similar to Bumper Balls from Mario Party and Mario Party 2. In this minigame, players use the or to move their bumper car and run into others so that they fall into the abyss and lose. The last one standing wins. Rules – "Hop on the amazing hoverkart and use it to ram your foes off the edge!" Advice – "When you see a kart near the edge, hit it hard!" This page was last edited on April 13, 2019, at 18:32.